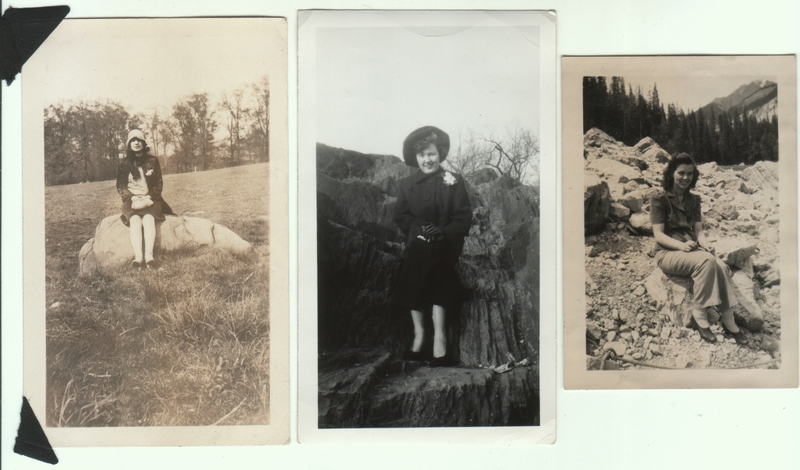 Three photos, ranging from 2.5 x 3.5 inches to 2.75 x 4.5 inches. Remnants of having been mounted in photo albums are on the first and third ones. Written on the back of the third one is Jean @ Banff. Otherwise undated and unidentified. As soon as I saw these, I thought GIRLS ON THE ROCKS. Went to IMDB and found there was a movie with that title, a comedy released in 1962 that was produced in Cuba, allegedly starring “New York sexploitation actress Gigi Darlene.” What would the catch phrase be — “Sitting pretty has never been harder”? Seriously, she does look like she’s having fun, but it’s more a “let’s drive to tea…oh, hey, what about a photo over there.” The photo on the left I get, as fields are easy to come by. The right says mountain locale, which I also understand as either day trip or multi-day journey. But the third is enigmatic. Could be anywhere. And thanks for commenting! I agree the ones on the ends are easier to understand/explain. The one on the right is Banff, which, though a mountainous Canadian national park, is enough of a tourist destination that this could easily be just a few steps off a road. But the one in the middle is a head-scratcher. It just seems like her position would have involved at least a little bit of climbing, for which she’s so improbably dressed. But you’re right, she appears to be having a good time, which is important for our enjoyment of the picture.